Despite daily questions on the Mike Duffy trial, a volatile stock market and drops in the polls, Conservative Leader Stephen Harper has appeared increasingly fired up this week — and comfortable showing his humorous side in front of supporters. At a rally in Hamilton Thursday, Harper went after Liberal Leader Justin Trudeau for saying a Liberal government would run deficits over the next three years to invest in infrastructure. "He'll run, he says, a modest deficit, a tiny deficit, so small you can hardly see the deficit," Harper said of Trudeau, pinching his fingers as the crowd erupted in laughter. "And only for three years, three deficits, three modest little deficits," Harper joked, before turning his sarcasm onto Kathleen Wynne, the province's premier. "Friends we've gone through this before. Look at the mess in Ontario with a modest deficit of the Liberal government," Harper said. "Those modest deficits have now had the credit rating of this province lowered by international markets." It's not the first time Harper has gone after either Trudeau or Wynne in this campaign. But all week he's been honing his daily attacks as he reacts to Trudeau's daily events. 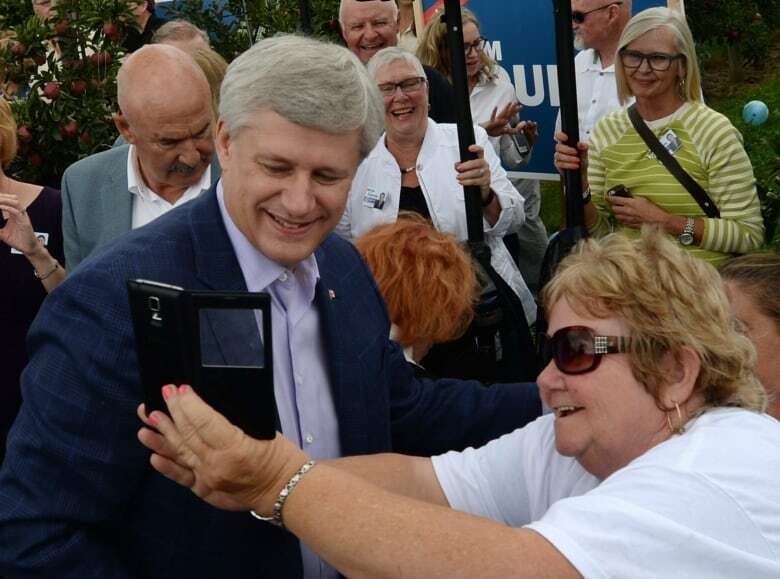 He even stopped to get selfie photos taken with volunteers at the apple orchard in Clarington, Ont. The Conservative leader also frequently went off script to make a joke, like in Hamilton when a baby kept crying as he started his remarks in a very crowded, airless campaign office. Harper stopped, laughed and said, "It's a bit hot."